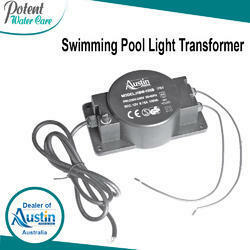 We are supplier & exporter of Swimming Pool Underwater Lights. 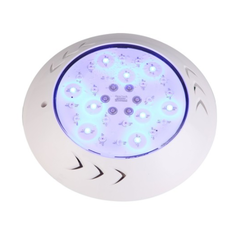 The LED lights for swimming pool are the resin filled lights with high brightness. The lights consume less power and are capable of changing 16 colors. 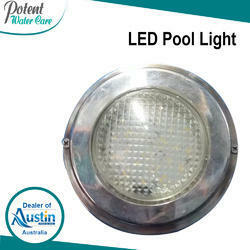 Manufactured using graded plastic, these lights offer longer service life of up to 1,00,000 hours and are used in swimming pools, public squares and fountains. 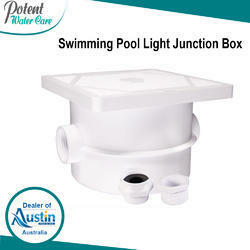 The Pool Lighting Fixture provided by us is designed using the latest technology.We obligated to meet the quality standards as per the customer demand. 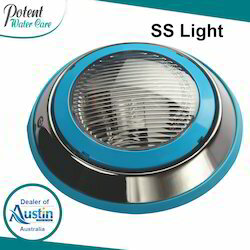 Potent Water Care brings the worlds most advance Stainless Steel Halogen Lights Euro integrative pipeless filter. The filter integrates the multiple function of filtration, disinfection, vacuum cleaning, illumination, whirlpool massage and 24 hour automatic control. The filter eliminates the requirement of balancing tank, buried pipes, plumbing and pump room. The Euro filter can fit any exiting water body, swimming pool or pond easily. 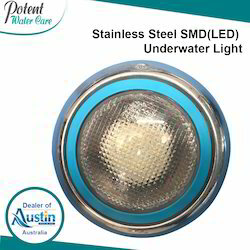 Minder SLH Stainless Steel Underwater LED Light is made from S.S. -304 for durable use. 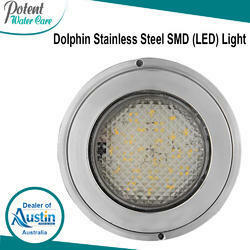 The wall mounted SS lights are easy to installed lights with only a 2 cm hole in wall panel. 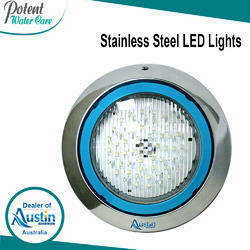 These easy to install lights are housed in stainless steel housing with face ring and are installed without any make-up panels. 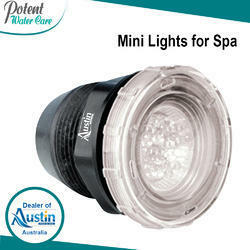 These lights are of !P68 waterproof standard and includes earth joints. 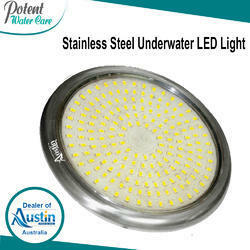 The power LED lights are water body wall recessed 1.5” FTA with stainless steel mounting. A wire of 1.8cx2 mm is provided as main supply cable and a high temperature soft cable of length 2 mtr is provided for IP68 connect safety. The provided glass is of 5mm and is extra clear and toughened. These are are available in stainless steel SS304-SS316 grade, in electron polished finish as per the requirement. 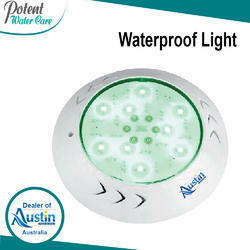 Suitable for swimming pool and fountains, these lights are installed for underwater use only at light angle of 120 degree. 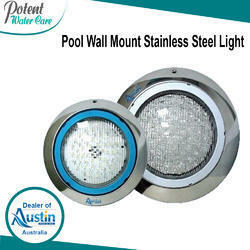 We are the leading suppliers of swimming pool accesorries. And also prividing best quality of products to our client. 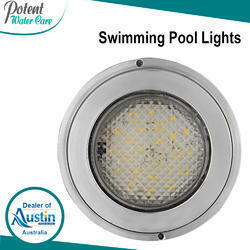 We are a leading manufacturer, supplier and exporter of swimming pool LED lights from India. These are manufactured from state of the art technology and high grade raw material procured from reliable vendors of the market. 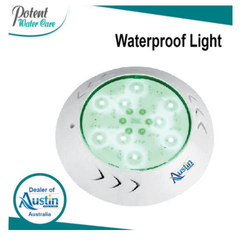 These waterproof LED lights have high working life. These are in high demand from our valued buyers and are sold at competitive rates. 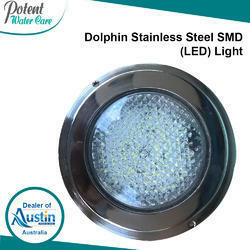 Relying on our expertise and know-how in this field, we are well-known as one of the prestigious organization in offering a wide range of Pool Halogen Light. This range of Pool Halogen Light is developed at well equipped production unit by making use of sophisticated machines and high grade quality raw materials. Products offered by us is highly demanded in various different places due to their unique designing and nominal prices. This product is available in several designs as per the specific demands of our valuable customers. The Underwater Halogen Light provide brilliant, double contact halogen quartz lighting for all concrete pools and spas. 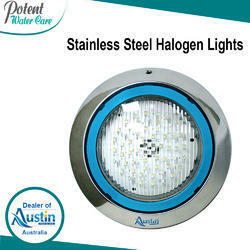 The design of light is patented and it is mounted in the poll using the mounting hub and bracket. This further eliminates the requirement of pre-punched light panels, make-up panels and extra braces. The light is easy to install and possess longer service life with 12V 100W/150W Extra cord for special storage. 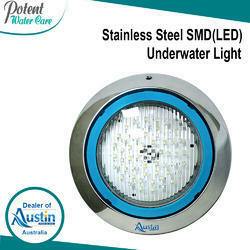 It is manufactured using high temperature and corrosion resistant components. We make stringent efforts to continuously improve and upgrade our processing process and offer an exclusive range of Swimming Pool Lighting Fixture. 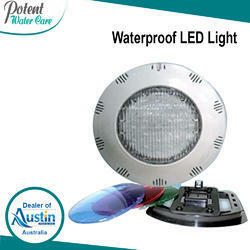 Our ranges of Swimming Pool Lighting Fixture are precisely tested by the team of experts. Our Customers can avail this product at reasonable prices in a committed time frame. We ensure our customers of timely completion of their assignments with our dedicated facilities. We use highly advanced techniques for the processing of our product range. To meet the satisfaction of our clients, we offer our entire products range in customized packaging. 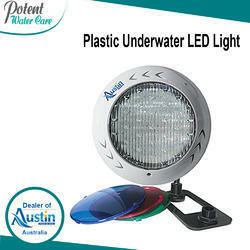 Looking for Swimming Pool Underwater Lights ?